Adventure Island has launched an indoor version of itself – Adventure Inside – so come rain or shine there’s even more fun to be had on Southend seafront. Adventure Inside features a wealth of exciting new rides, games, food outlets and entertainment – on two storeys. Launched in time for the Easter holidays, the distinctive, curved centre has five fun-tastic new rides – including a Pirate Plunge, Smiles Per Galleon, a traditional ‘galloper’ Carousel and Bounce Spin. Adventure Inside also offers a superb new soft-play area, featuring a Play Stack and Play Pod for toddlers and bigger boys and girls, plus a variety of state of the art video games – including an amazing Star Wars experience – operated by Adventure Island’s great value swipe cards. 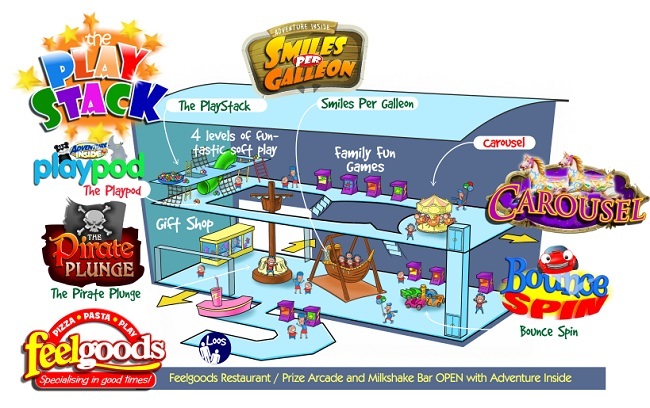 Naturally, all this fun and adventure works up a real thirst and appetite, so it’s rather handy that your little Adventurers can take their pick of a wide range of delicious meals and snacks from any one of the catering points, including Adventure Island’s ground-breaking Feelgood’s Pizza Pasta Play restaurant, milkshake bar and games arcade – which is linked to Adventure Inside via a tunnel. Whatever the weather you can enjoy Adventure Inside all-year round daily from now on, and it’s included in the Adventure island Annual Pass.